One of the reasons many readers enjoy historical fiction is that it provides a glimpse into the lives, relationships and traditions of different countries and eras. Weddings and marriage are, by far, one of the most fascinating topics to research. Here are five interesting facts I discovered about weddings and matrimony during the Regency era while writing my upcoming release, A Wedding Code (The Code Breakers series book 5, releasing April 25, 2017). For many centuries, marriage was not based on love, but as a strategic alliance between families for monetary, social or political gain. Marriages were often arranged when the bride and groom were still children. Although the popularity of love matches began gaining popularity in 18th and 19th century England, demonstrating passion for one’s spouse was considered déclassé. Almack’s, a London social club, became one of the most prominent “marriage marts” of Regency England. Debutantes, who once sought to be presented at the King’s court, vied for vouchers from Almack’s patronesses so they could be presented there instead. Regency brides did not commission gowns exclusively for their wedding. Most gowns were re-worn. Although any color or pattern was acceptable, blue, white, silver and light-colored hues were most popular. Instead, many brides cherished their wedding shoes as treasured keepsakes. Brides were given a wedding ring during the wedding ceremony, but men did not wear wedding rings. What is your favorite contemporary or Regency-era wedding tradition? As a renowned arbiter of fashion and design, Miss Amelia Bonnington’s upcoming nuptials to Lord Derrick Brinsley have become the most anticipated event of English society. Her plans to create the perfect wedding must be cast aside, however, when her best friend’s brother, a member of England’s top code breaking family, disappears. When his fiancée meddles in dangerous spy activity, Derrick, an undercover agent for His Majesty, must intervene. Now, it's up to Amelia and Derrick to safely locate the missing brother, prevent another abduction, and thwart an assassination. Can they outwit the French spies and still have Amelia’s fairy tale wedding? 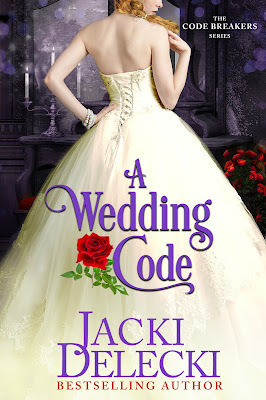 Jacki will be giving away an ebook copy of A WEDDING CODE to one person leaving a comment or email entry. I think it is the escorting of the bride down the aisle and "giving her away." It does not need to be the father of the bride who does it. The escorting and handing over is a reference to women as possessions to be exchanged at a formal ceremony. Something I am certain most modern women would not approve. To me it has morphed into a symbolic act of the brides family approving of the groom and handing her over to a new future she will build with her groom.